PORT AU PRINCE, Haiti — A Dutch navy ship carrying much-needed aid for stricken Haiti has had to turn back because of a lack of port security. The HNLMS Pelikaan has 35 tons of food, shelter and hygiene kits from Curacao to help after Hurricane Matthew, and is permanently stationed in the area for just this sort of operation. 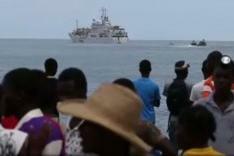 But thousands of people gathered on the shore at Jeremie Port and, with minimal security or no organized way to distribute the aid, the ship was forced to leave. Post-hurricane flooding has reactivated the cholera outbreak UN peacekeepers brought to Haiti after the 2010 earthquake, and Matthew has added a further 175,000 to the homeless list. Close to one and a half million people need urgent humanitarian aid.